At the center of Correa’s foreign policy activities is the strengthening of regional Latin American organizations in which there are no U.S. representatives: the Community of Latin American and Caribbean States (CELAC), the Union of South American Nations (UNASUR), the Bolivarian Alliance for the Peoples of America (ALBA), and others. Correa always supported Hugo Chavez’ initiatives which enabled the lessening of the region’s dependence on the Empire, the nullification of the Monroe Doctrine in the Western Hemisphere, and the interaction of Latin American countries with other centers of power. In this respect Ecuador is setting an example by establishing comprehensive cooperation with China and Russia in the political, economic and military fields. U.S. presence in the country is decreasing, and the Obama administration is trying to break this trend. 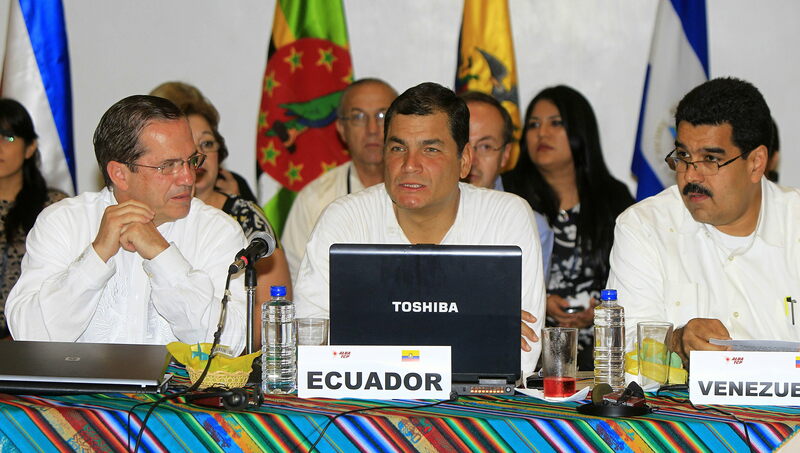 President Correa has been designated as the main culprit in the deterioration of American-Ecuadorian relations. It was Correa who initiated the international campaign against the Chevron corporation. The arbitration court in The Hague released the company from payment of multibillion dollar fines for polluting the Amazon river basin on the territory of Ecuador. Correa could not agree with such a humiliating and unjustified decision. He visited the ecological disaster zone and showed TV journalists his hands covered with crude oil left at a former extraction site, saying, «This is the result of the company using outdated technologies». Correa urged consumers not to buy Chevron products. An Ecuadorian court allowed a suit filed by Indians living in the ecological disaster area to proceed and compelled the company to pay 19 billion dollars in damages for the harm inflicted on the environment and the health of the population. Making use of its great experience in fighting such suits, Chevron obtained a decision in its favor from the International Arbitration Court in The Hague. However, Correa is not giving up, and he has secured the support of UNASUR and ALBA and urged the international community to show its solidarity with Ecuador. There are now no Chevron assets in the country, but the claims of the Ecuadorian plaintiffs could be satisfied in Argentina, Brazil or Canada, which threatens serious financial consequences for the company. The Obama administration has decided to protect its interests at any cost, and that is one of the factors which is directing U.S. intelligence toward a radical solution to the «Correa problem». The president of Ecuador is also hindering the development of the Pacific Alliance, one of Washington’s neoliberal geopolitical projects, which includes Mexico, Colombia, Peru and Chile. The Alliance was created to neutralize the ALBA bloc, and Ecuador’s membership in the latter alliance does not jibe with U.S. strategic aims in the Asia Pacific region at all. Spying on the Ecuadorian president by U.S. intelligence has increased noticeably. Interception of Correa’s telephone conversations and the communications of his inner circle, his security agents and his police cordon lets the Americans keep track of the president’s movements and event sites, participant lists and security systems. Constant monitoring provides ample material for identifying vulnerable spots in the organization of security. Recently, in his traditional Saturday televised speech, Correa told Ecuadorians about the suspicious concentration of U.S. military personnel at the American embassy in Quito. «All embassies have their military attaches,» said Correa, «usually no more than one. But here they have over 50!» He said to Foreign Minister Ricardo Patino, «Verify this information! Such a thing [the large number of American military representatives] should not be. They should be brought to a normal level». The president also demanded that an incident on the Ecuador-Colombia border be investigated in which an Ecuadorian helicopter with several American military personnel on board was shot at. Correa’s concern is understandable; the U.S. base in Manta was closed in 2009, but Pentagon military advisors and U.S. intelligence agents conduct operations on Ecuadorian territory with no limitations. The intensification of the spying and subversion activities of American intelligence in Ecuador is obvious. According to information obtained from Cuban experts by the site Contrainjerencia.com, CIA personnel alone were doubled in 2012-2013 at the Ecuadorian station. Dozens of new agents arrived in the country. They operate not only from the territory of the U.S. embassy in Quito, at which there are at least a hundred diplomats (! ), but they also use the consulate in Guayaquil. In order to make room for the increased number of U.S. intelligence personnel in this strategically important port city, the State Department had to build a new consulate building which, according to one intelligence agency friendly to Ecuador, houses NSA electronic equipment. The consulate is headed by David Lindwall, who arrived in the country after a tour in Iraq as Counselor for Political-Military Affairs. Lindwall has also been a Political Officer at the embassies in Bogota, Managua, Tegucigalpa, Asuncion and other Latin American capitals. His name often appears in WikiLeaks publications. Even a quick analysis of telegrams bearing his signature leads to the conclusion that Lindwall is an experienced career employee of the CIA who is well versed in Latin American affairs and has been sent to Ecuador to resolve very delicate problems. President Correa has often called the United States an «arrogant» power which is trying to force its understanding of «universal democratic values» on the world and give others «lessons on morality and good behavior». The president constantly points out that the U.S. has one of the world’s most imperfect election systems which makes it possible for the losers to win. Correa considers the attempts of the Agency for International Development (USAID) to force American patterns of democracy on Ecuador and other countries as if they were colonies to be «insulting». Recently, when commenting on USAID’s termination of financing for several projects in the country in the amount of 32 million dollars, Correa offered Washington, not without sarcasm, to help bolster American democracy on the same amount. The USAID office is leaving Ecuador, but U.S. intelligence operations for destabilizing the country continue. By all appearances, new attacks in this area will be made in connection with Correa’s plans to reduce the size of the armed forces and transfer part of the military personnel to police agencies. Anonymous «army dissidents» are already making hostile statements with regard to Correa and his attempts to «take Chavez’ place on the continent». This wording directly indicates what forces are behind the campaign being launched against Correa. During a police uprising in September 2010 the president of Ecuador was caught in the crossfire of snipers and narrowly escaped death. Might not U.S. intelligence be planning something similar in the near future? After all, after the bombing of the World Trade Center in New York in 2001, intelligence agencies received carte blanche to eliminate those designated as enemies of the U.S. No one has repealed that decision.